Hi there! 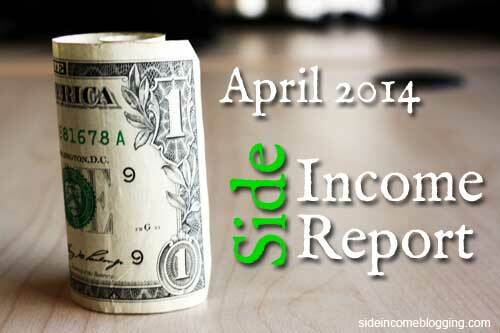 Time again for another side income report, and this one is for April 2014. To say I was pleased with my April earnings would be an understatement. Earnings for April were up $156.26 over March ! Before I jump into the numbers (near the bottom), I want to update you on a few things. One of my big issues, and something I’ve fought with since I started blogging in 2006 is not focusing on what really matters. I blog for two reasons, 1) to earn money 2) to help people. I often catch myself doing things that don’t have anything to do with either of these two goals. For example, I’m terribly guilty of tweaking the look and feel of my various sites. I’ll update a graphic, change some widgets around, try new social media icons, etc. Why? Because I like playing around with web site users interfaces. The problem, the changes I’m making don’t generally have any effect on my bottom line. Waste of time. I also have a bad tendency to spend far too much time looking at my analytics data when I should be focusing on writing content. Just being honest with myself, I have not been producing near as much content as I should be, especially here on Side Income Blogging. I started to change this last month, and will continue this trend into May. I think this is one of the main reasons I saw a revenue increase. I’ve been talking about and planning to write an eBook for SIB for more than a year now. I finally decided I need to stop talking about it, and start doing it. Last week I started working on a eBook that I intend to give away free when you sign up for the SIB newsletter. The eBook is based off a presentation I’ve been using with some clients and for some local blogging seminars I’ve done. I decided to expand it out into full eBook. The eBook is intended to help you become a better blogger. My plan is to have the eBook completed and available on the site by the end of the month. If you’re currently on my email list, you’ll receive a special email with a download link. You’ll be the first to see it. If you aren’t on my email list, use the box below to sign-up. Speaking of the newsletter, for the past 5 years, my mailing list has using an RSS based campaign to send out any articles I publish via email. Beginning this week, that is changing. Instead, on most Friday’s I’ll be sending out a simple text newsletter that will highlight new articles published, popular posts here on Side Income Blogging, along with any product and industry news updates. I think the format will be a lot more useful to you, and I like it better because it’s a little more personal. I’ll be typing up each and every newsletter instead of just using an automated email. Now, notice I said “on most Fridays”. I don’t intend to do one every week, as I don’t want to send something out unless I have something to say. My whole intent with this new format is to provide you with a short and concise newsletter that keeps you updated on what’s going on here at Side Income Blogging and on the blogging industry in general. After spending a few hours doing some keyword research in Market Samurai, I found a great target keyword and a number of excellent longer tail keywords. I decided to try building out an Amazon review/authority content site for it. I’ve picked a domain name, and hope to begin setting up the site later this week. I’ll be writing about it in the next week or so here on Side Income Blogging. My intent is to take you step by step through he process I used. Will it be a huge success or huge failure. We’ll both find out, so stay tuned. I had signs early on that April was going to be a good month, and was so happy to see me end out the month with an increase over March. While not my highest earning month of the year (January was), April is now #2 and it’s put me back on track to my goal of $1000.00/month. I know it’s early, but I already know some of my income for May, and May is on track to be the best month of the year, with another large increase. Whoo-hoo! I did expect my Amazon affiliate earnings to again increase, as they had been since late last year. But for April, they were down. Figuring out why took me a bit. I had to do some research on my keywords. Turns out in 2013, I was ranking in the top 10 for the keywords “Best Blood Pressure Monitor 2013”. That search term, for obvious reasons, declined significantly in February of 2014. The good news is that I started ranking well for “Best Blood Pressure Monitor 2014” in March, so that should, over time, make up for it. I’ve made a reminder for next year to anticipate this, and create specific pages to handle it so I get indexed early. MyDomain: $10.00 – Domain name registration for my new niche site. April was a great month, and hopefully the turning point in me reaching my goal of $1000.00/month in passive income! How did you do? What big changes are you making to “up your game” ? Congrats your earning has been increased. I’ll follow your journey. BTW: What social sharing plugins are you using? It look very nice.